An intense finishing touch to any meal. 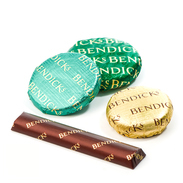 Bendicks Bittermints, the original and most famous Bendicks mint, made to the original recipe of 1931. 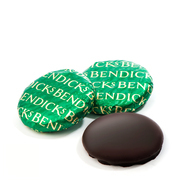 An intense, solid mint fondant covered in thick, smooth dark chocolate containing 95% cocoa solids, a perfectly unique experience. The ultimate mint chocolate assortment. A selection of delicious after dinner mint chocolates, when only the best will do, our Mint Collection will never fail to impress. A selection with something for everyone. Our Mint Collection contains: Bittermints, Bendicks most renowned after dinner mint comprising of intense peppermint oil and 95% cocoa solids’ chocolate. Mint Crisps, distinguished by their handmade honeycomb wrapped in smooth, dark chocolate and natural peppermint taste. Elizabethan Mints - Dark chocolate with a soft peppermint fondant centre. Dark English Mints – Dark chocolate baton infused with fresh peppermint oil. The ultimate premium Mint Crisp. Handmade honeycomb, wrapped in a smooth dark chocolate infused with peppermint oil. How can you possibly resist?